A couple weeks ago I shared the first part of our somewhat healthy Italian dinner, the Cheesy Bruschetta not so healthy part. Now here is the main dish! Since Kevin feels like he needs to have protein at every meal I ended up getting some frozen meatballs to add to extra sauce for the Zucchini Linguine. 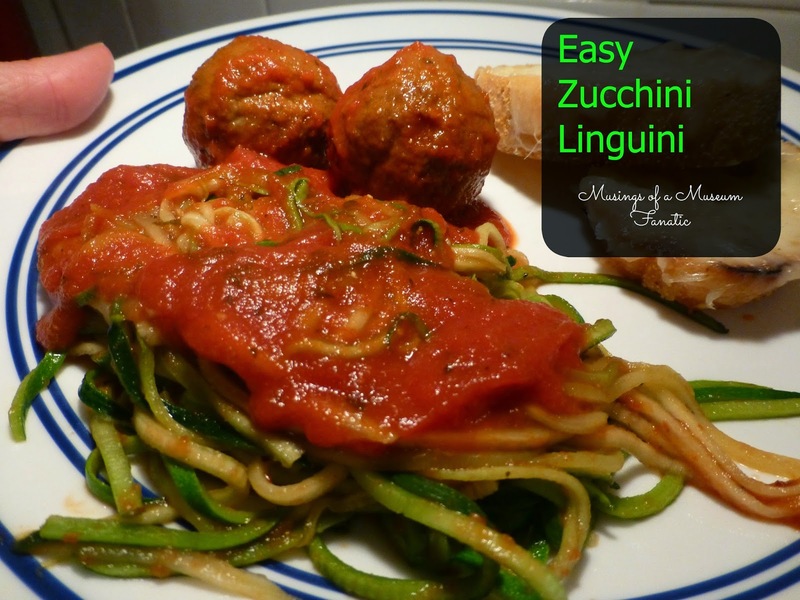 I would probably make my own meatballs in the future but the zucchini definitely paired well with them. 1. Use the Julienne Peeler to cut zucchini into thin slices. (Stop when you hit the seeds.) Add zucchini to Rockcrok® using Chef’s Tongs. 2. Add marinara sauce and garlic pressed with Garlic Press. Microwave, covered, on HIGH 4 minutes. Stir. 3. Serve with heated extra sauce and protein if desired.